There are two types of fit testing, 1. quantitative and, 2. qualitative. For quantitative fit testing you’ll need a machine (ex. Portacount), a respirator that will protect more than 50x the limits (>full face). I will not cover this type of fit testing in this post, but it is very similar. A medical clearance (not needed if you are wearing a paper dust mask) for each employee wearing a respirator. Respirator w/P-100 filters (1/2 face respirator or more protective), aka HEPA filters, purple in color. fit test kit -your choices are: saccharine, irritant smoke, Bitrex, or isoamyl acetate-bananas. Buy it online, or at your local safety supplier. Look at their instructions. if they cough, it means they smelled it. 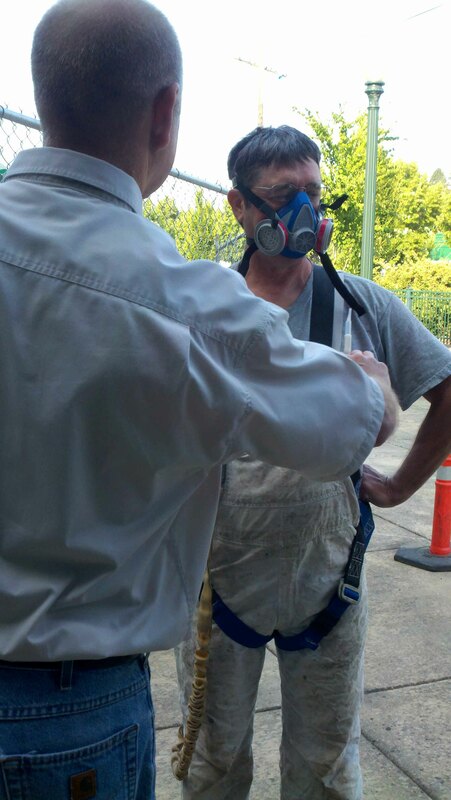 it doesn’t require a containment to be built to perform the fit testing. The employee must be clean shaven around where the mask touches the face. I allow “short” goaties where the facial hair does not touch the mask. The fit test procedures are easy to follow and found inside the kit. There are 8-steps, do each one for about 1 minute each. While you have the employee captive, you might as well give them some training. Here are some questions and/or points to note. did you train them on positive & negative fit checks? why are they wearing a respirator? what are the limitations of their respirator? how will they store the respirator? how will they sanitize it? will they share their respirator? Finally, sign and date the form. It expires one year from this date. Simple? yes. Easy to forget something? yes. Industrial Hygiene in Construction is powered by	WordPress 5.1 and delivered to you in 0.430 seconds using 30 queries.